Traveling has truly become one of my favorite things to do. I travel to learn about different cultures, people and history. Being a visual learner, traveling has taught me more about the world than any textbook could. I travel for inspiration and I’ve noticed that I feel very connected with myself when I am in a distant place, immersed in a new and unfamiliar culture. On my recent trip to Paris, I practiced self-care (a little more than my usual routine) and really listened to what my body was telling me. Prior to this trip, when traveling, I would overexert myself and as a result, would end up feeling drained, bloated, constipated and my skin would break out. I didn’t want to feel this way during my first time in Paris (I’ve only been dreaming of going there for years! ); so I implemented self-care practices. These things were easy to incorporate during my days there and they definitely made a difference. I started preparing myself prior to my flight by drinking a lot of water, staying away from caffeine & alcohol and eating very clean. I worked up until the day before I left, so I made sure I was diligent about my water intake. I work 12+ hours during the week and that can really take a toll on your body especially if you’re about travel internationally. A long flight dehydrates your skin, so I made it a priority to get sufficient sleep and to moisturize my skin well (and layer on that SPF because people of color need SPF too!). If you have a full-time job and are about to travel internationally, I would highly suggest preparing the week before by drinking a lot of water, keeping caffeine & alcohol to a minimum, getting enough sleep and moisturizing! A 6+ hour flight can be very draining! While on the plane, I made sure to hydrate with plenty of water (luckily I was sitting near the bathroom). I also boarded the flight make-up free – instead opting for an overnight mask I got from Sephora (for less than $10 might I add). The mask is a clear jelly so I didn’t look too crazy! I also went to Trader Joe’s prior to my flight and bought snacks – I am a plant-based eater and unfortunately many flights are not plant-based friendly. I’ve also noticed that most airports don’t really have many plant-based food options either. I stocked up on baby carrots, raw almonds, beet chips & instant oatmeal (just ask the flight attendant for an empty cup & a cup of hot water and voila!). My flight ended up being delayed so these really came in handy and gave me the nutrients I needed to help me feel my best (and I also saved money by not having to buy expensive airport food). I made sure to pack my journal and I found time daily to journal, reflect and write down everything I was grateful for. I found bookstores, cafes and coffee shops and made sure to feed my soul daily. Paris is one of those cities where you can get lost, find amazing things while being lost but eventually you will find your way back to where you need to be. I walked around a lot and was in awe of the beautiful architecture, art and the people of Paris who seem to really enjoy life. Café’s face the chairs and tables in the outside seating area towards the streets and sidewalks so that patrons can people-watch. The French really are big on taking their time eating, drinking and taking in their surroundings. I loved this because living in a city like New York, I often get sucked into the hustle and bustle of the city and forget to enjoy the moment that I am in. I really appreciated Paris because it taught me that just because I live in a big city; that doesn’t mean that I constantly have to live a fast-paced lifestyle. Another thing I did was to eat intentionally. I continued to eat healthy because I knew that is what makes me feel my best. I know what croissants and pastries taste like and I didn’t desire to have any because I knew it would make me feel bloated and just not my best. However, I am a believer in treating yourself and if you really want that pastry or croissant then go for it! Surprisingly, Paris had a lot of plant-based options in their restaurants – being plant-based to me means eating a diet mostly consisting of vegetables but also occasionally eating fish/seafood. The food tasted a lot more clean there and not processed. I realize that every time I travel internationally, the food tastes a lot more clean – the fruits and vegetables actually have flavor on their own which makes me question what we’re eating here in the U.S. (but that’s a whole topic on it’s own). The French have very light breakfasts and eat dinner late but don’t really snack during the day – I adapted to their way of eating because when traveling, I like to live like the locals. My breakfasts consisted of fruit, tea and a slice of toast; lunches were a salad/sandwich and dinners were mostly tuna tartare with some kind of vegetable and grain. I did indulge on dark chocolate daily from a South-African owned and sourced chocolatier brand, Afrikoa – this chocolate satisfied my sweet tooth while getting my antioxidants in! I continued to do my nightly routine and I made sure to rest! The days are long in Paris; it doesn’t start getting dark in the summer until around ten at night so that made me stay up really late but since I was on vacation; I slept-in unapologetically. My days consisted of a lot of walking and exploring but I also was mindful of taking things slow and resting. I often feel like I have to see absolutely everything while traveling but I had to remind myself that it’s pretty much impossible to see everything a city has to offer in a week or two – I’ve been living in NYC for 5 years and I am still finding new things in the city. By the end of my trip I started appreciating life more and learned that the art of slow-living is truly beautiful. I was actually surprised at how much I was still able to get done during the day when practicing self-care on my trip. I kept my caffeine and alcohol intake to a minimum and continued to drink lots of water. This time traveling, I wasn’t bloated or constipated and I generally felt better physically, mentally and emotionally. 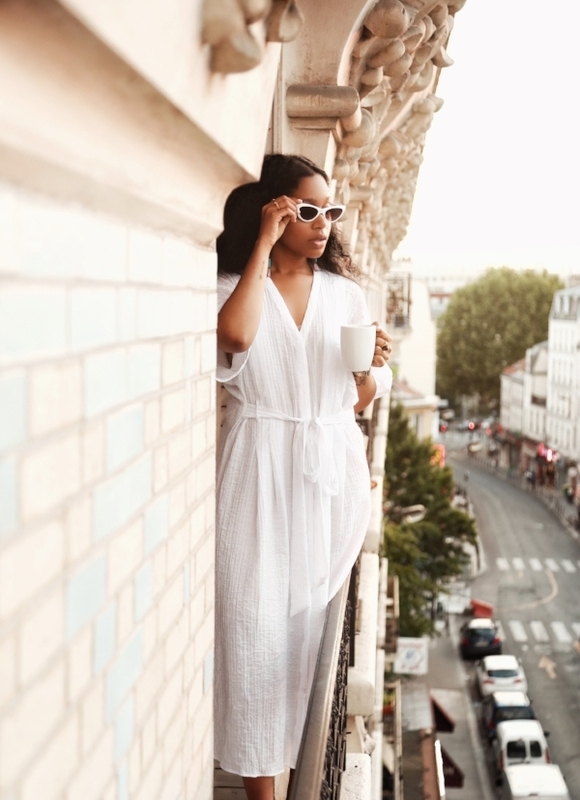 Practicing self-care while traveling allowed me to really take in my surroundings and truly enjoy my first time in Paris. Traveling can be stressful and overwhelming but it really doesn’t have to be. A little self-care goes a long way.